Visier Announces Career Journeys, a New People Analytics Capability that Leverages Historic Data to Map Potential Career Paths - Visier Inc.
What intermediate roles should I consider to achieve my career goals? Which path is the quickest, and which is the most common? How long does an individual typically stay in each role? 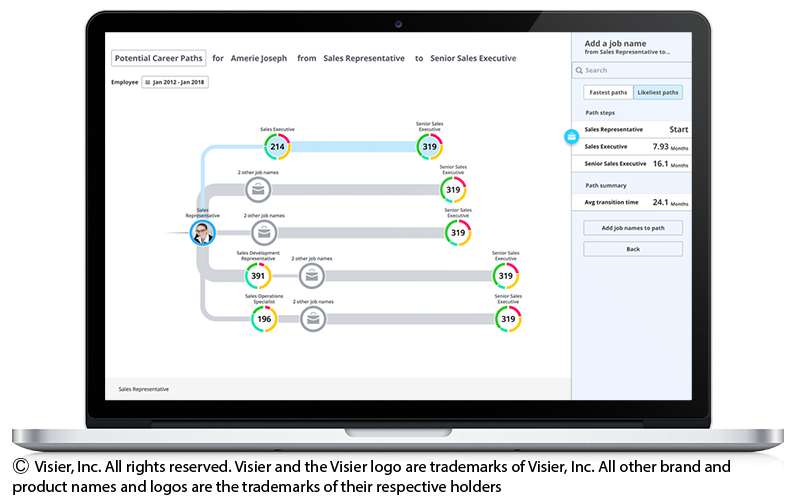 Visier People’s Career Journeys analyzes an organization’s historic people data, and calculates the many routes employees have taken from one role to another. The outcome is a map of all the career paths taken within an organization, with insights into the fastest and most common paths.